Kids Girls Floral Mint Floral Summer Sun Party Dresses. Elasticated Waist & Soft Plates Waist To Hem. A Beautiful Free Belt Attached. UK Size; 7-8 Years, 9-10 Years, 11-12 Years & 13 Years. A Nice, Great, Perfect & Trendy Gift For Girls. 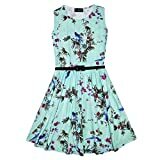 Shop With Confidence Simple Returns 30 Days Returns/Exchanges Accepted ✔ All Orders Dispatched Within 24 HOURS ✔ Here Is Girls, NEW SEASON Mint Abstract Floral Print Skater Dresses. High Quality Soft Fabric. UK Size; Age 7-8 Year 9-10 Year 11-12 Year & 13 years. 95% Polyester And 5 % Elastane. I Have Got, More Styles In My Shop As Well. Thanks for Looking Check out my other items!